Mr. Walker established his own practice in 1979, in Newport Beach, California, where he emphasizes business and real property litigation along with the representation of businesses, partnerships and corporations and the defense of employment matters for employers. Mr. Walker acts as outside general counsel for several small and medium size businesses. In the past several years, Mr. Walker has litigated cases involving commercial leases, real property, partnership dissolutions, quiet title, breaches of commercial contracts and real property financing. 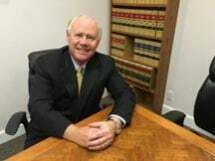 He has also handled matters that have been resolved without the need for trial, relating to real property bankruptcies, foreclosures, real property financing, finder's fees, and creditors' bankruptcy rights. He also litigates in the probate courts, handling trust disputes, will contests and assorted other probate issues. Mr. Walker draws upon his previous extensive courtroom experience with the U.S. Air Force as a Judge Advocate (1970-1974) and as a principal of a former California law firm that specialized in real property and business litigation (Virtue & Scheck, Inc., 1974-1979), where Mr. Walker furthered his extensive jury trial experience. As an active participant of various arbitration panels for the State and County Bars and U.S. Bankruptcy Court, Mr. Walker has also proven his skills as a mediator and arbitrator. The Walker Law Firm holds an AV-rating in Martindale-Hubbell, where Mr. Walker is listed in the Bar Register of Preeminent Lawyers for civil trial practice.